If you’re looking for a unique terrarium idea, then check out this video by the folks at eHow. It explains how to put together a stunning orchid terrarium, even if you have never given it a shot before. Whether you are a veteran or a fairly new indoor gardener, this on-point DIY video addresses many of the concerns that you may have regarding terrariums. I think you will truly love this vid, especially if you really want to try your hand at making an orchid terrarium. Check it out and see if you agree with my take. For more unusual terrarium ideas, I also suggest checking out a book on terrariums by Tovah Martin entitled “The New Terrarium“. After thumbing through a few pages in her book, not only did I find several really simple, quick and usable terrarium ideas I could use, but I also had one of those “ah ha” moments! I realized I was still picturing the terrariums of yesterday. You know, the plants in a fish bowl sort of thing. When I saw the kind of the “outside of the box” terrarium ideas she was using, I could clearly see why terrariums are enjoying such a resurgence in popularity. It opened my eyes to a whole new way of looking at them. 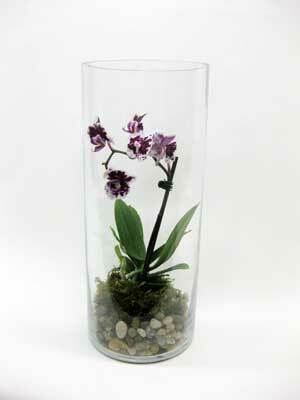 Some of the ideas I culled from the book we’ve used in the shop, like the orchid terrarium shown here. It can easily be created in a cylinder vase along with some decorative pebbles and moss, in just a few minutes time. Finding everything you need is pretty simple. Local florists, garden centers and hobby shops carry a variety of terrarium supplies. You can also shop a complete line of terrarium plants, containers and supplies here. Listen, right off the bat, there’s something I want to tell you. Truthfully, my own selfish needs are really what prompted me to create this site. See, I can’t seem to get enough when it comes to tutorial videos (like the orchid terrarium vid you just finished watching), and a cool site where I could re-watch and share my favorite videos is really what I was after. I also recognize a good opportunity when I see one. Just thought you might appreciate the truth. So please visit whenever you’d like! I’m just gonna keep sharing more and more top-notch videos addressing the subjects of floral design, wedding flowers, and home decor ideas… for starters. As always, it means a lot to me to hear what my visitors think of the content I share. So tell me what you thought of the orchid terrarium video in the comments section below.